Chalets Domaine les Adrets: 2 room apartment 4 people. Adrets is a private district which comprises of 4 traditionally built and well kept chalets, in Gerardmer, Vosges, France. Their warm decor offer a soft environment and an exceptional calm setting with view over the lake. The newly-built chalets are well looked after and have comfortable Savoyard style furniture. Its location on the hillside overlooking Gerardmer, Vosges, France is ideal: 500m from the centre of the resort and the shops and 700m from the tourist information centre and the pistes (skibus stop 300m away). All the apartments offer a balcony or private terrace with view over the lake. Surface area : about 35-40 m². Living room with bed-settee. Bedroom with double bed. Kitchenette with oven, hood, dishwasher, electric cooking rings, fridge. Shower room with Separated WC. Balcony OR Terrace. This nice and authentic chalet with sauna is suitable for 4 to 6 people (2 bedrooms and a mezzanine) and is ideal if you're looking for a holiday home in the heart of the Vosges, where you can optimally enjoy the natural surroundings near the house and even from the house itself. An area without mass tourism, where authenticity, pleasant atmosphere and excellent local gastronomy come together. The chalet is furnished in a simple way, but offers everything you need. The sauna is a real treat! By the way, you also have a wonderful large garden with BBQ at your disposal. Under the chalet there's a small studio for 2 to 3 people (with separate entrance). The house is well insulated though, so you can be sure of your privacy. It's also possible to rent the studio and chalet together; nice if you're with a larger group! About the surroundings: The beautiful village of Saint-Maurice-sur-Moselle is located in the heart of the Vosges, at the foot of the Ballon d'Alsace and the Ballon de Servance, in the Moselle valley. Height differences between 550 and 1250 metres offer you the possibility for endless walks, cycling tours, but also good winter sports opportunities. Access to the skiing area of Le Rouge Gazon and Ventron (30 km in pistes, varying from green to black); they're 12 km away and certainly worth the ride. This is a wonderful place for skiing, snowboarding, cross-country skiing, tobogganing and show shoe walking. For beginners there also is a ski school with treadmill, good for all ages, from toddler to adult. There are also various events being organised here during the holiday period, like tours with torches and sled racing by night. Would you rather look at all these things from a distance? Then try out the local kitchen! There are plenty of possibilities to do so. Other tips are a visit to the 180 km long Alsace wine route, starting 30 km away in the town of Thann, with beautiful stops in the so-called "French Venice" Colmar (74 km and again a wonderful car ride) all the way to Strasbourg (150 km), with its idyllic Christmas markets and summery outdoor cafes. By the way, you're only 80 km from both the Swiss and the German border. For your holiday rental in the Vosges , come and discover the residence "Les Grandes Feignes" in the ski resort of Bresse Hohneck . A very comfortable residence, located at the foot of the ski slopes of La Bresse and of the ski school (ESF). It consists of 47 spacious apartments, tastefully decorated in regional style. These apartments, from the studio for 3 people to the 4-room apartment for 8 people, are fully equipped with television, bed linen and kitchenette with dishwasher, hobs, oven, fridge, coffee maker etc. The apartments, from the studio for 3 to the 4-room apartment for 8 people, are equipped with a kitchenette (vitroceramic or electric hob, oven or microwave, dishwasher), bathroom with toilet and free television. The building is equipped with a lift. La Bresse is a small village in the Les Vosges mountain range, between the lakes and mountains, making the most of the nature reserves of the "Ballons des Vosges" . Many wild animals, such as falcons, lynx, live in the environment of a wild and unspoiled flora, in an environment of multicolored flower fields, forests of pine trees and beech trees and mountain meadows. La Bresse , dominated by the Hohneckberg, which rises to a height of 1366m, you can combine mountain hikes at medium altitude with sporting activities, for the pleasure of young and old. For an active summer holiday in the mountains, La Bresse is an ideal destination: - Hiking, nature walks with animals, Nordic Walking - Mountain bike, cycling - Adventure path, orientation circuit, via Ferrata, climbing - Horse riding, tennis - Paragliding, bungee jumping - Summer sledding - Canyoning - Fish - Cinema - Quad-bike, go-kart - Archery - Mini golf - Spa, well-being - Swimming pool La Bresse is an ideal starting point for exploring the Vosges : - in La Bresse: the Champtel square, the church of La Bresse, the former copper mine, the replica of the "Manneken Pis" statue, the Piquante Pierre monument, craftsmanship, farmer visits, the lakes (Lispach, Ténine, Corbeaux, Blanchemer) , the Lande dam, the Hohneck mountain. - the regional nature park of the «balloons des vosges» - Gérardmer with its famous lake - Epinal Colmar THE KIDS An up-to-date slope slope, the Schlitte mountain, which works just as well in winter as in summer, over a descent of almost 700 m, it alternates between sharp turns, waves, jumps and turns at 340 ° .. . High sensations guaranteed, in complete safety (seat belts, headrest for passenger rear seat, braking system and automatic brake on arrival ...). Activity older than 4 years. Children's center: for children from 18 months to 6 years, with the possibility for children over 4 years to combine ski lessons with childcare. Mini Piou club, Piou Piou club and ski school: from 3 years La Ludoneige for 4/12 tourist Office 2A, rue des Proyes Website: ... /> Free outdoor parking space Fee-paying WiFi Free access to the swimming pool in la Bresse Residence at the foot of the ski slopes Free access to the swimming pool of Bresse, at 7km Meal! Possibility of option 7 dinners, half board or full board - Deposit and tourist tax to be paid on the premises. The deposit is returned after inventory on the day of departure or by post. The accommodation must remain perfectly clean. Otherwise, a statutory sum of the guarantee will be maintained. Bed linen included Pets allowed against supplement - Apartment rental - Bed linen included - Free access to the swimming pool in La Bresse - Free services Please note: all additional services are subject to change without notice. All information provided is intended to be informative and general. We will not be liable if such changes occur. Option booking not available Please note: the rates do not include the mandatory hirers' liability insurance. This small amount is a percentage of the rental sum starting from 10 Euros per reservation. Chalet New 6 persons Pets welcome. New chalet, all wood interior and beam posts, triple glazing in response to the R2012. Pets educated welcome Located 4km from Lake Gerardmer and that of Xonrupt ,. 5 km from La Mauseleine ski resort and 10 km from La Bresse ski resort. For your holiday rental in the Vosges , come and discover the residence "Les Grandes Feignes" in the ski resort of Bresse Hohneck . A very comfortable residence, located at the foot of the ski slopes of La Bresse and of the ski school (ESF). It consists of 47 spacious apartments, tastefully decorated in regional style. These apartments, from the studio for 3 people to the 4-room apartment for 8 people, are fully equipped with television, bed linen and kitchenette with dishwasher, hobs, oven, fridge, coffee maker etc. The apartments, from the studio apartment for 3 to the 4-room apartment for 8 people, are equipped with a kitchenette (vitroceramic or electric hob, oven or microwave, dishwasher), bathroom with toilet and free television. The building is equipped with a lift. La Bresse is a small village in the Les Vosges mountain range, between the lakes and mountains, making the most of the nature reserves of the "Ballons des Vosges" . Many wild animals, such as falcons, lynx, live in the environment of a wild and unspoiled flora, in an environment of multicolored flower fields, forests of pine trees and beech trees and mountain meadows. La Bresse , dominated by the Hohneckberg, which rises to a height of 1366m, you can combine mountain hikes at medium altitude with sporting activities, for the pleasure of young and old. For an active summer holiday in the mountains, La Bresse is an ideal destination: - Hiking, nature walks with animals, Nordic Walking - Mountain bike, cycling - Adventure path, orientation circuit, via Ferrata, climbing - Horse riding, tennis - Paragliding, bungee jumping - Summer sledding - Canyoning - Fish - Cinema - Quad-bike, go-kart - Archery - Mini golf - Spa, well-being - Swimming pool La Bresse is an ideal starting point for exploring the Vosges : - in La Bresse: the Champtel square, the church of La Bresse, the former copper mine, the replica of the "Manneken Pis" statue, the Piquante Pierre monument, craftsmanship, farmer visits, the lakes (Lispach, Ténine, Corbeaux, Blanchemer) , the Lande dam, the Hohneck mountain. - the regional nature park of the «balloons des vosges» - Gérardmer with its famous lake - Epinal Colmar THE KIDS An up-to-date slope slope, the Schlitte mountain, which works just as well in winter as in summer, over a descent of almost 700 m, it alternates between sharp turns, waves, jumps and turns at 340 ° .. . High sensations guaranteed, in complete safety (seat belts, headrest for passenger rear seat, braking system and automatic brake on arrival ...). Activity older than 4 years. Children's center: for children from 18 months to 6 years, with the possibility for children over 4 years to combine ski lessons with childcare. Mini Piou club, Piou Piou club and ski school: from 3 years La Ludoneige for 4/12 tourist Office 2A, rue des Proyes Website: ... /> Free outdoor parking space Fee-paying WiFi Free access to the swimming pool in la Bresse Residence at the foot of the ski slopes Free access to the swimming pool of Bresse, at 7km Meal! Possibility of option 7 dinners, half board or full board - Deposit and tourist tax to be paid on the premises. The deposit is returned after inventory on the day of departure or by post. The accommodation must remain perfectly clean. Otherwise, a statutory sum of the guarantee will be maintained. Bed linen included Pets allowed against supplement - Apartment rental - Bed linen included - Free access to the swimming pool in La Bresse - Free services Please note: all additional services are subject to change without notice. All information provided is intended to be informative and general. We will not be liable if such changes occur. Option booking not available Please note: the rates do not include the mandatory hirers' liability insurance. This small amount is a percentage of the rental sum starting from 10 Euros per reservation. 2 room apartment 4 people view on the valley - 2 rooms for 4 people. The establishment: Located on one of the most beautiful views of Plombières, The Villa of the Three Lights welcomes you for your holidays. Less than 10 minutes walk from the center (shops, cinema, restaurants), thermal baths or the casino. Les Vallées *** - 3 rooms 6 persons Forest Side. The establishment: Located 8km from the village of La Bresse, in the Hautes Vosges, Residence Les Grandes Feignes *** welcomes you for holidays in peace and harmony with the surrounding nature. Kelche: 2 room apartment 4 people. Small residence "Kelche"&comma; 3 storeys&period; In the resort 500 m from the centre of Gérardmer&comma; 1&period;5 km from the skiing area&period; In the complex&colon; storage room for bicycles&comma; storage room for skis&comma; central heating system&comma; heating to be paid on the spot&period; In Winter&colon; please take snow chains&period; Public parking&period; Shop&comma; restaurant 500 m&comma; indoor swimming pool 1 km&period; Golf course 29 km&comma; tennis 1 km&comma; ice field 1 km&period; Nearby attractions&colon; Casino 1 km&period; Surface area : about 43 m². 2nd floor. 2-room apartment 43 m2 on 2 levels on 2nd floor. Living/dining room with 1 double sofabed (140 cm), TV (flat screen), boiler (50 litres). Exit to the terrace. Kitchen (4 hot plates, mini-oven, microwave, electric coffee machine). Exit to the terrace. Shower/WC. Upper floor: 1 room with 1 french bed (140 cm). Sep. WC. Terrace 20 m2, south facing position. Terrace furniture. View of the mountains and the ski run. Facilities: washing machine. Reserved parking space n 7. Maximum 1 small pet/ dog allowed. Gerbépal: 2 room chalet 6 people. Gerbepal 8 km from Gerardmer&colon; Chalet "Gerbepal"&period; Outside the resort&comma; 8 km from the centre of Gerardmer&comma; 8 km from the lake&period; Private&colon; property 500 m2&period; Garden furniture&comma; barbecue&comma; single garage&period; Grocery 400 m&comma; restaurant 600 m&comma; bakery 400 m&comma; outdoor swimming pool 8 km&period; Golf course 26 km&comma; tennis 8 km&comma; slopes 8 km&period; Well-known lakes can easily be reached&colon; G&rardmer 8 km&period; Please note&colon; car recommended&period; Chalet located on a slope overlooking the mountain and the valley&comma; below the main road&period; Surface area : about 51 m². Ground floor. 2-room chalet 51 m2, on the upper ground floor. Living/dining room 20 m2 with 1 double sofabed, digital TV, video, radio and CD-player. Exit to the terrace. 1 room with 1 french bed. Kitchenette (4 hot plates, oven, dishwasher, microwave, freezer, electric coffee machine). Bath/WC. Electric heating. Upper floor: (steep stair) gallery with sloping ceilings, ceiling height 100 - 200 cm with 2 beds. Terrace 20 m2. Facilities: washing machine. Maximum 1 pet/ dog allowed. A delightful, Italian-inspired cottage, in the Vosges. This attractive family home with its Art-deco influences was built in 1907 by the great-grandfather of the current owners. Safeguarded throughout the generations, this heritage is a harmonious marriage of past and present. The apartment is located on the first floor and is decorated with sophistication. It boasts an independent entrance, can sleep up to 5 and offers a full range of comforts. This distinctive village house combines countryside pleasures with all the amenities of the nearby town of Remiremont. Its garden, backing on to the gentle slopes and foothills of the Hautes Vosges, emanates a very special relaxed rhythm of life. On the edge of a popular holiday resort called La Bresse lies this wooden chalet set in a chalet deveelopment. The quaintly decorated chalets are spaciously laid out and have a terrace to the front and side of the accommodation, garden furniture and a barbeque. The chalet is comfortable with a few modern extras which make your accommodation a pleasant holiday spot. Like a jetstream and massage shower where you can relax heavenly. At the heart of the Parc Naturel du Ballon des Vosges and the ski area of La Bresse-Hohneck this place is perfect to spend winter. If you like active holidays, you came to the right place. In summer too this small mountain town is ideal to relax in tranquillity. La Bresse-Hohneck is one of the largest ski areas in the north-east of France where beginners and experienced skiers will find what they need in the various ski run levels. You should not worry there won't be enough snow. 270 snow guns make these ski areas truly dreamy! There are lots of activities all year round. Swimming, climbing, tennis, bowling... you name it. And if it's nature you want, there are no less than 250 km special baths to explore magnificent forests. A chalet (120m2) with a big terrace of 75m2 and a property of 200m2 is situated in the nature park of Des Ballons des Hautes Vosges. Close to the ski slopes of ventron, in the niehgbourhood of la Bresse and the Elzas. A destination for the entire year; in winter with snow and for the rest of the year, you can hike, swim (in the lake of Saulxure sur Moselotte) and cycle wonderfully. La Bresse is situated 13 km. south of Gerardmer. This lovely village is situated in the hart of the Vogezen, between trees and forests, hills and valleys and amidst lakes and brooks. It offers numerous recreational possibilities including, cycling, fishing, walking and water sports. The lake of Gérardmer and Longemer are at 15 km. from the chalet. La Bresse has a water play park where your little ones will certainly enjoy themselves! We can certainly recommend a drive along the particularly beautiful Route des Crêtes (near La Bresse). The detached chalet was built against a hill and is situated ca. 3 km. from the town centre of La Bresse. It has a rustic, well kept interior with lots of wood. You have a terrace at your disposal. This holiday home in Saint-Dié-des-Vosges is an ideal destination for families or small groups of 6 to 8 people (3 bedrooms) who want to unwind and/or be active in the beautiful unspoiled natural surroundings of the Vosges. The accommodation is managed by a young, very friendly Dutch couple, surrounded by a couple of nice dogs. The holiday home is very well equipped for young and old and is very bright; this way you can fully enjoy, both inside and outside. The holiday home is located on the second floor of a renovated farmhouse. From the bedroom you can see the large garden with its many seating areas and luxurious above ground swimming pool. The holiday home is located in a cul-de-sac, so that you can really enjoy the peace and quiet. You can go on countless walks and cycling/motorcycle tours (mountain bike as well). The pleasant centre of Saint-Dié-des-Vosges is 5 km away. 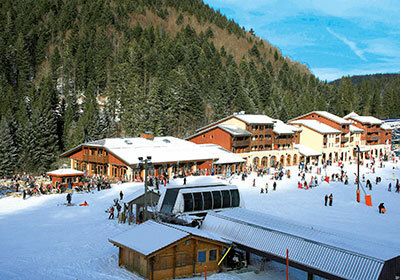 Well-known summer and winter sports resorts la Bresse (44 km) and Gérardmer (33 km) are certainly worth a visit. Every year there are great events being organised, like the motorcycle festival in Gérardmer (in May) and the World Championship mountain biking (in August). In the winter you can fully enjoy the slopes. Saint-Dié-des-Vosges is located in the Meurthe valley right next to the Ballon des Vosges regional nature reserve. The town is characterised by a beautiful cathedral of pink sandstone from the Vosges, le Tour de la Liberté, various churches and colourful gardens of Callunes. From Saint-Dié-des-Vosges you can go anywhere throughout the year. The famous lake Lac de Pierre Percée (28 km) is the largest artificial lake in the Lorraine. This area is also called 'little Canada'. In addition to swimming beaches, there are hiking trails, kayak and water bike rental and other water sports. Tips: For a fee, a wonderful breakfast including lunch package will be delivered! In consultation there's a possibility to arrange a nanny (who speaks Dutch, French and English). Do try the homemade jam, made from fruit from the garden. Situated on the edge of a hamlet, with beautiful views of the mountains, a brand new, comfortable chalet (100m2). Pleasantly furnished chalet. Many walking and cycling routes in the surrounding area. Large swimming lake Gerardmer at 30km and tropical swimming pool at La Bresse at 20km. Skiing and Langlaufen possible in the winter. Within 800m high, a chalet, encircled by the massive of the Vosges in the nature park nature park Ballon des Vosges. From this house, you can find many beautiful hiking routes, and you can reach these by foot or mountain bike. Lakes, swimming pools and other meeting places for various recreation possibilties within 10km (the lake of Gérardmer and the lake of Saulxures sur Moselotte). Adventure park, parasailing and summer bob sleigh in Bresse (15km), and not forgetting the trip over the mountain ridges "La route des Cretes" or a "marquaire meal in one of the Inn farms. During the winter the winter sport station of van l'Ermitage Frère Joseph have the following to offer: ski, ski school. Langlauf and snowshoe hikes. Furthermore, you can enjoy the Elzasser wines; visit the various museums (about cars, railways, textiles). Germany is close to Switzerland, only 1 hours drive. Welcome to la Bresse, the absolute heart of the Vosges and the destination for every sports enthusiast in summer and winter. The chalet was built in 2012 and is completely new and fully furnished. Quality is of paramount importance to the homeowner. So you can use the sauna to relax after a day of activity. The chalet lends itself perfectly for families and/or groups of friends up to 8 people. 3 bedrooms and a spacious mezzanine with large box springs that ensure that you wake up refreshed every morning. The homeowner also has his own hotel and restaurant, where you can dine for a nice price. For just a small fee, more than enough food is provided, and even drinks are offered. A fun night out in the backyard! The mountain massif of the Vosges has countless routes for hiking, cycling, mountain biking or motorbiking. In winter you have access to the 3 ski areas in la Bresse. Perfect for young and old. La Bresse has a lovely centre with several restaurants, bars, supermarkets, bakeries and cafes. There is also a swimming pool and a cinema. No need to get bored! Every year the world cup mountain biking takes place at the end of August, a large-scale event with plenty of festive activities. For the motorcycle enthusiast, the motor festival in Gérardmer takes place every year at the end of May (14 km). Tips! - (Electric) mountain bikes can be rented on-site. - In front of the chalet, there is a ski rental shop in winter. You can discuss receiving a discount there from the homeowner. - The chalet is suitable for disabled persons with its wide doors/frames, and bedroom, bathroom and toilet on the ground floor.